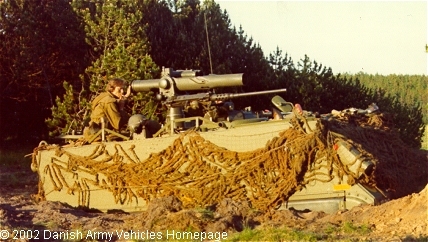 56 M113 is equipped with 147 mm TOW-launcher (M/87). Each vehicles carries 10 missiles. The launcher has gone through several up-grades and is today equipped with thermal sights. Effective range is between 65 and 3.700 m (improved TOW). The vehicle is armed with a 12.7 mm (cal .50) machine-gun. The TOW-equipment was earlier mounted on Landrover half ton and the Ford M151A1. Some of the vehicles have been upgraded to G3DK standard (91 kb).